As trends such as cloud computing and DevOps become the de facto standard, organizations are increasingly looking for next-generation analytics tools and services that provide continuous intelligence to help them build, run, and secure modern applications, and to accelerate their journey to the cloud. However, they struggle with challenges related to security, siloed tools, and customization. A new survey conducted by UBM and Sumo Logic highlights the need for visibility into and intelligence about the full IT application stack. Enterprise IT operates far differently today than it did a decade or even just five years ago. The modern app era is redefining the way that enterprise IT teams build, run, manage, and secure their applications. Instead of running only their own servers in a traditional data center, today’s organizations are far more likely to be using public cloud computing services and/or their own private clouds. They are moving away from monolithic legacy applications based on three-tier architecture to modern apps built from loosely coupled microservices that run on a variety of platforms. To stay competitive, businesses must be innovating all the time. Their customers expect personalized apps that anticipate their needs and wants. IT can no longer get away with updating apps once a year or less, and it certainly can’t afford any downtime for performing maintenance. Customers and employees alike want to be able to access real-time data at any time of day or night. To meet those needs, IT organizations have changed as well. Instead of having distinct development and operations teams, more enterprises are adopting a DevOps approach, where the two groups share responsibilities and work together far more closely than ever before. This helps them address performance issues more quickly, while also dramatically speeding the development process. Many modern organizations are using Agile, continuous deployment, and similar approaches to push out updates on a daily or weekly basis. But this new app ecosystem presents challenges from a monitoring and maintenance viewpoint. In some cases, IT teams still rely on the same old siloed tools they had used for their legacy environments. Many struggle to get visibility into the entire application stack in modern, diverse environments where fast performance and 24/7 availability are mandatory. Cloud-based machine data analytics vendor Sumo Logic recently commissioned UBM to research these trends in greater depth. In December 2016, UBM conducted a survey of 235 IT operations, application development, and information security professionals at companies with 500 or more employees to assess the current state of IT operations and modern app tools. The responses provided more detail about how cloud computing, DevOps, management tooling, security, and customization are transforming enterprise IT, as well as a look at where these trends might be heading in the future. Yesterday, the cloud was an emerging technology, but in the modern IT environment, it has become the de facto standard. Only 20% of enterprises surveyed aren’t using any public cloud services. 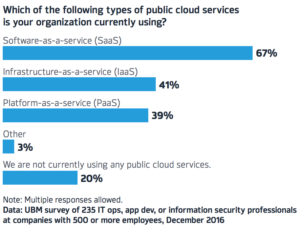 Two-thirds (67%) are using software-as-a-service (SaaS), and about four out of 10 are using infrastructure-as-a-service (IaaS) and/or platform-as-a-service (PaaS). In the early days of the cloud, Amazon Web Services (AWS) took the lead as the cloud computing vendor of choice. But the survey revealed that as the cloud matures, organizations are becoming more comfortable with vendors other than AWS and are using multiple cloud vendors. In fact, while other reports show that AWS still has a lead in cloud market share, the top cloud vendor in this survey—which included only organizations with at least 500 employees—was Microsoft Azure. 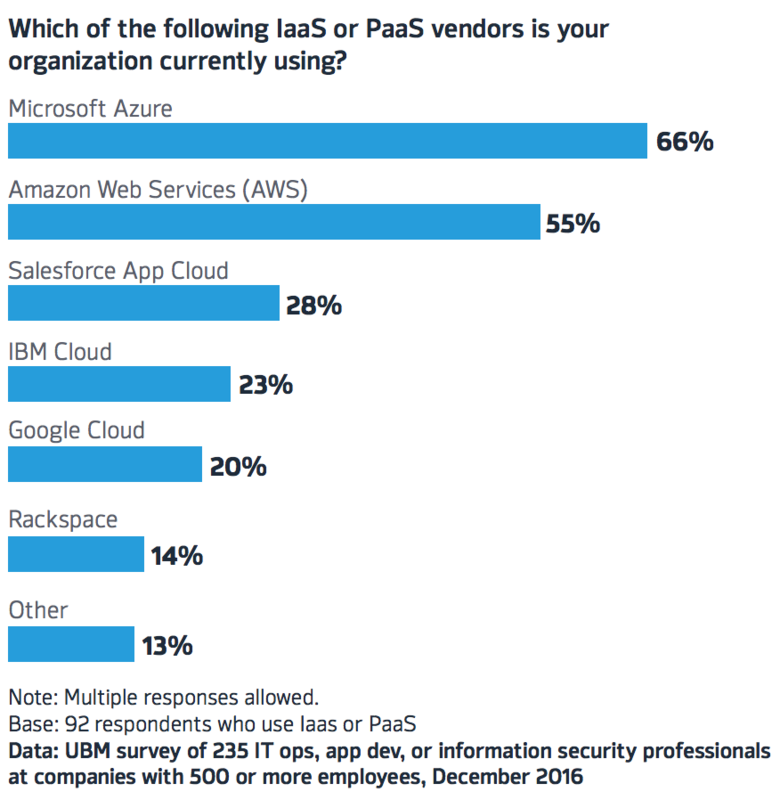 When asked which IaaS or PaaS vendors they were using (with multiple responses allowed), 66% of respondents cited Azure. Interestingly, more than half of the Azure users were from organizations with more than 10,000 employees, which suggests that Microsoft’s cloud is particularly popular with large enterprises. AWS came in second with 55% of respondents, followed by Salesforce App Cloud (28%), IBM Cloud (23%), and Google Cloud (20%). Cloud computing offers enterprises a number of benefits, such as greater agility and flexibility, lower costs, support for mobility, improved collaboration capabilities, and immediate access to up-to-date software. Companies using the cloud often say they can bring new products and services to market more quickly, and they roll out new customer- and employee-facing applications more frequently. All of these capacities can spur greater productivity and faster growth, not to mention giving organizations a competitive edge. However, the cloud can also introduce complexity into the IT environment. Many organizations are using multiple cloud-based applications, as well as multiple IaaS and PaaS vendors. In many cases, IT has less visibility into the cloud services that employees are using, which makes it more difcult to monitor, manage, and secure the applications and data that reside on those services. Like the cloud, DevOps is also becoming the norm for large enterprises. Born from the Agile software development movement, DevOps seeks to apply Agile principles to the management of IT infrastructure. It encourages closer collaboration between developers and IT operations staff, and DevOps shops often rely heavily on automation to speed the delivery of new applications and updates. The concept has been around for less than a decade, but it has quickly gained traction among organizations seeking to increase their agility and improve their responsiveness. In fact, only 12% of the organizations surveyed said they have no plans to adopt DevOps practices. However, most organizations are either still experimenting with the concept or have limited adoption to a few teams. Eleven percent of respondents said their entire IT organization has embraced the approach, while 57% have implemented DevOps on a limited or trial basis. 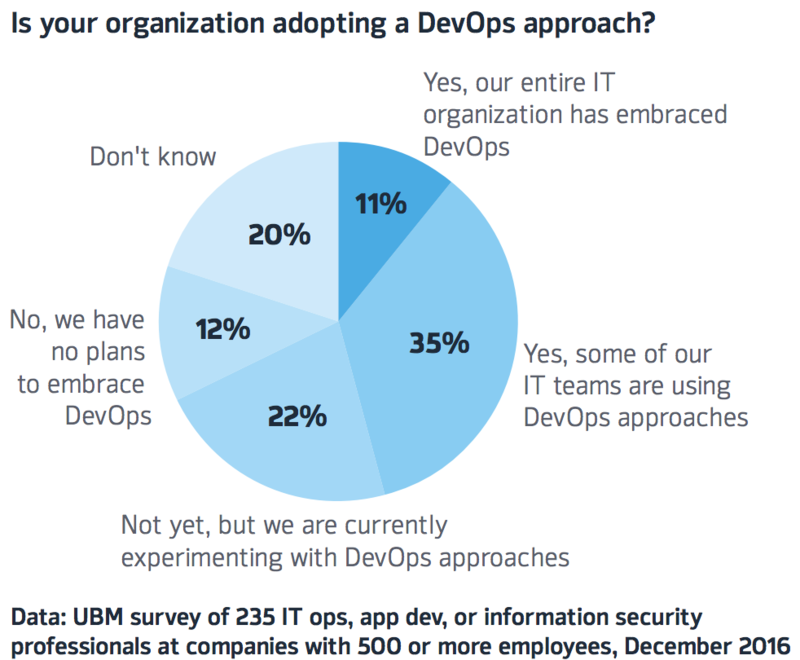 This suggests that organizations may adopt DevOps more widely if they experience the anticipated benefits of the approach. Because continuous delivery is one of the hallmarks of DevOps, it shouldn’t be surprising that the embrace of DevOps is leading many organizations to increase their pace of application development and deployment. In fact, 42% of those surveyed said they are deploying apps more frequently than in the past. And only 8% of respondents said they were deploying apps less frequently than in previous years. Faster updates and more frequent deployments should help them better meet customer demand. However, despite their development and deployment speed increases, organizations have plenty of room for improvement if they want to remain competitive. It still takes most teams months to develop new apps or release updates. Only 3% of those surveyed said they could turn out a new app in less than a week, and just 16% could do it in a month. For the majority (51%), app development takes several months, with 12% saying it takes about a year, and 6% take even longer. Similarly, most application updates are still taking place on monthly or yearly cycles. Only 3% of respondents update apps at least once a day. More than half (55%) are rolling out updates at least once a month or more often, but 3% are still updating apps annually. These numbers suggest that many organizations are not innovating fast enough to meet customer expectations. However, their slow approach to implementing continuous delivery and other DevOps principles may have an upside. DevOps is a dramatic change for long-established IT shops, and making the shift can be difficult if managers don’t approach it thoughtfully and carefully. Embracing DevOps at a measured pace may help organizations overcome the cultural challenges involved, while gradually increasing the speed of application development and deployment in a modern software delivery life cycle. Unsurprisingly, many enterprises still have concerns about cloud security. Since the earliest days of the cloud, organizations have been worried about the potential risks to applications and data that are on infrastructure outside of their direct control, and many cloud vendors haven’t yet completely addressed those concerns. 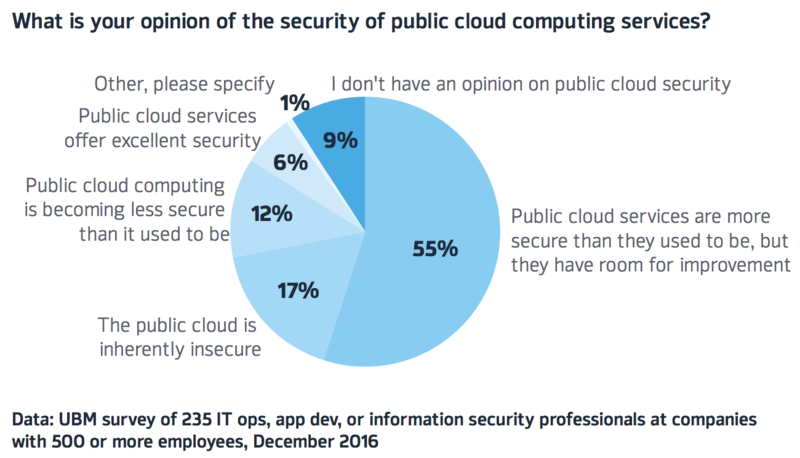 When asked about their opinion of the security of the public cloud, only 6% described it as “excellent.” And the majority (55%) said public cloud services are more secure than they used to be, but they still have room for improvement. In addition, when asked about their biggest challenges related to cloud computing, security was the top answer, selected by 27% of respondents. Other key challenges included migrating applications and data to the cloud (15%), obtaining a unified view of cloud and traditional IT infrastructure (8%), and managing cloud-based apps and operations (7%). Two of respondents’ biggest cloud challenges — obtaining a unified view and managing cloud-based apps — directly relate to one of the other big trouble spots for modern IT: management tooling. The changes in infrastructure mean that IT operations must monitor, troubleshoot, and secure more applications and platforms than ever before. Stack, tool, and data diversity have become the new normal, and many teams are struggling to keep up as applications, data, and tools proliferate. Among those surveyed, most organizations are using between four and 10 tools to manage their growing portfolio of custom apps. 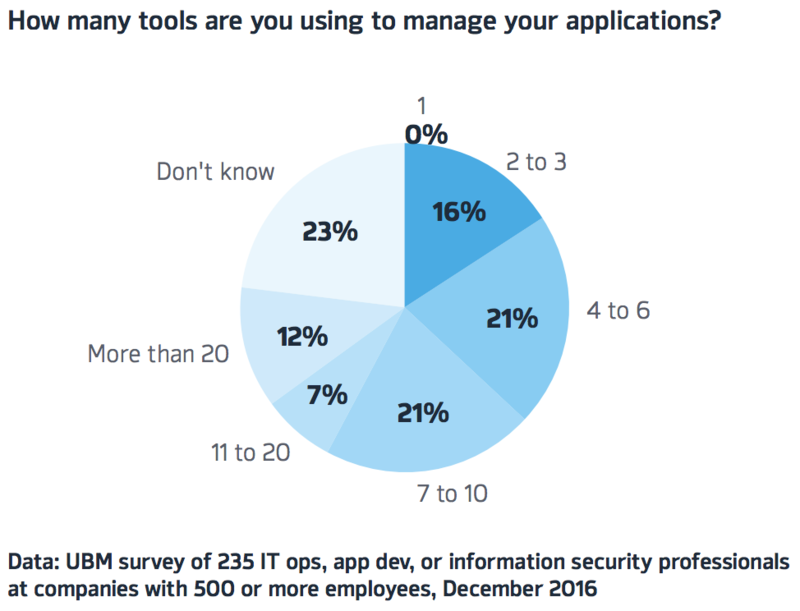 And, more than one in 10 are actually using more than 20 application management tools. This suggests that many organizations have siloed tools that perform only a few tasks rather than unified management solutions that allow them to monitor and maintain their entire stacks. However, organizations don’t expect this situation to change anytime soon. A majority (59%) said they expect the number of tools they are using to stay the same or increase slightly over the next two years. These teams may not realize that modern tools could help them gain the unified view they are seeking while also helping them improve IT operations efciency and application availability. The good news related to IT management is that organizations are using more advanced tools to analyze their operations data. Among those surveyed, 67% use log management tools, and 85% expect their use of log management tools to increase or stay the same over the next two years. In addition, 79% are either already applying analytics or machine learning to their log data, or they plan to do so. Many of the changes taking place in IT are good for enterprises. Trends such as the cloud and DevOps are helping organizations become more flexible and responsive to market conditions. But most companies still have work to do when it comes to their pace of innovation and their ability to support the modern app ecosystem. As they embrace the cloud and DevOps, organizations are finding themselves with complex, heterogeneous environments that are difficult to monitor and manage. IT teams no longer have to worry only about legacy client-server applications running on their own hardware. They now have public, private, and hybrid cloud environments to manage, as well as their traditional architecture. This new reality is pushing traditional tooling past its breaking point. Most enterprises are using far too many tools to monitor what is happening with their systems and cloud services. This lack of unified tooling makes IT operations less productive, and it hampers their ability to ensure constant availability and to troubleshoot performance slowdowns. Enterprise IT needs a way to gain full visibility and intelligence of the entire IT application stack. Modern, consolidated app monitoring and management tools that have been designed from the ground up to support today’s more diverse environments may help overcome these challenges. This centralized tooling could also help improve security and compliance while enabling organizations to become more competitive. 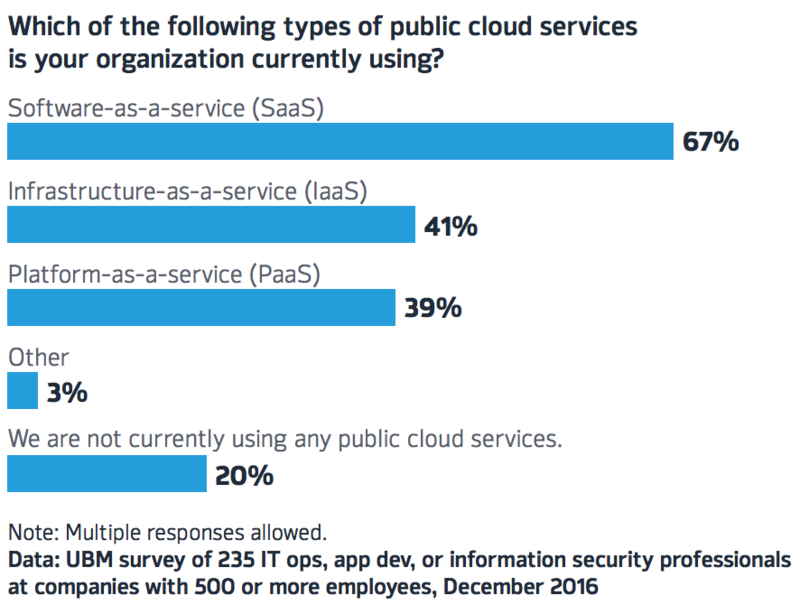 80% of those surveyed are using or planning to use public cloud services. 66% are using Microsoft Azure, compared to 55% using AWS. 68% either plan to adopt DevOps practices or are already doing so. 42% are deploying and updating apps more frequently than in the past. 55% said public cloud services are more secure than they used to be, but they still have room for improvement. Sumo Logic commissioned UBM plc to conduct an online survey in December 2016 exploring the current state of IT operations and modern application tools in enterprises. The final data set comprises 235 IT operations, application development, and information security professionals. All respondents are from companies with 500 or more employees, with roughly half from companies with 5,000 or more employees. About one-third of respondents work in IT management, including titles such as CIO, CTO, VP of IT, IT director and IT manager. Respondents’ companies are in a wide variety of industries, with the healthcare and financial sectors strongly represented. The margin of error for the total respondent base (N=235) is +/- 6.4 percentage points. UBM plc was responsible for all programming and data analysis. These procedures were carried out in strict accordance with standard market research practices.